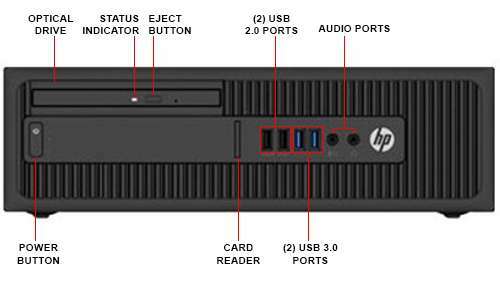 HP ProDesk 600 G1 Small Form Factor PC is a speedy and responsive machine that keeps pace with your multitasking. Quickly open new files and switch applications with less wait time. Quickly open new files and switch applications with less wait time, thanks to an optional solid-state hybrid drive. Power through your day with greater speed and performance. Get the latest in processing technology with your choice of 4th generation Intel® Core™ i3 processor. Easily share your internet connection with your devices and help colleagues get online fast with HP Wireless Hotspot. Productivity and manageability in one. Give busy teams the edge they need to stay ahead. 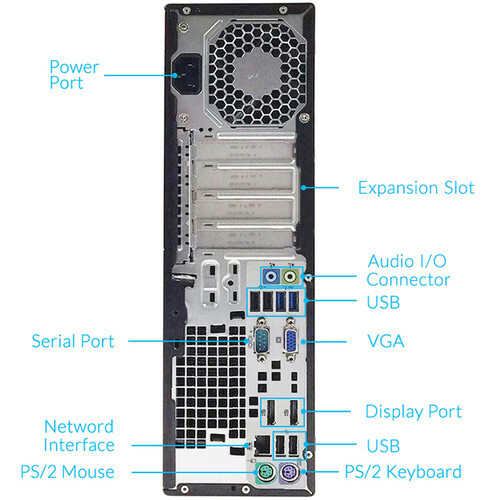 This PC's hybrid drive responds to the speed of work and opens applications right away. Powerful security and business-class management software frees up IT staff time. There’s plenty of screen room for all of your work with support for multiple displays. Make the most of virtual conferencing. Bring work to life through rich sound and video with DTS Sound and an HD webcam. Keep your most important devices easily connected. Access and transfer data fast with two front USB 3.0 ports. Share presentations, videos, and other content—no cables needed. WiDi Intel® Wireless Display lets you connect your ProDesk to projectors and other WiDi-ready devices. Put in more face time. You’re ready for web chats and conferences with Skype™ pre-configured on your HP ProDesk 600 G1. It’s almost as good as being there. If you want to add external storage, optical drives, mice, keyboards, printers, memory card readers, and more, the ProDesk 600 G1 offers four USB 3.0 Type-A ports, six USB 2.0 Type-A ports, two PS/2 ports, and one RS-232 serial port. Use the SuperMulti DVD Burner for optical media purposes and for network connectivity, Gigabit Ethernet LAN provides a more stable and reliable connection to the Internet. 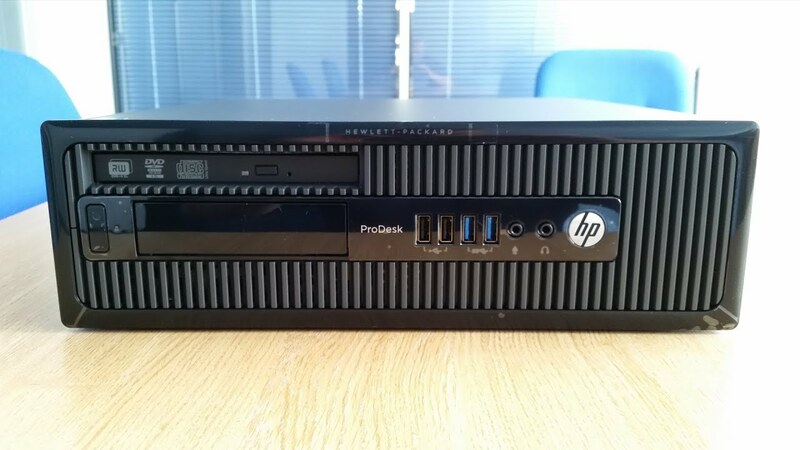 The HP ProDesk 600 G1 Small Form Factor Desktop operates using a built-in 240W power supply and includes a power cord and a PS/2 keyboard and mouse. HP Client Security software suit helps you quickly and easily encrypt your hard drive, permanently delete unwanted or discarded data, restrict unauthorized access, and more. Stay up and running. HP BIOS Protection offers enhanced protection against virus attacks and other security threats, and is designed to help prevent data loss and reduce downtime. You can help safeguard your data with easy backup and recovery, using HP Recovery Manager. Securely store all of your passwords and speed up access to your favorite password protected applications with HP Password Manager. Get right to the updates you need and spend less time managing updates with HP Support Assistant. With the Hp 18.5 monitor TFT, enjoy crisp, clear views of your documents and e-mail with 1366 x 768 resolution, 5M:1 dynamic contrast ratio, and 5 ms response time on an 18.5-inch diagonal screen. Quickly and easily connect to your devices with a VGA input. Attach your HP Desktop Mini, HP Chromebox, or select HP Thin Client directly behind the display for an integrated, affordable workspace that’s perfect for small spaces. Or, use the integrated VESA mount to place the display on a wall or stand. Order the Refurbished HP ProDesk 600 G1 PC today and have it delivered to your doorstep within 1-3 working days or same day delivery within Nairobi or Mombasa. Payment on delivery.